While the thought that fruits and vegetables are healthy for us has been engrained in everyone’s minds, there’s a common issue that many consumers may disregard. Whether your fruits and veggies are shipped locally or cross-country to grocery stores, markets, or other retail outlets, they’re most likely covered in agricultural pesticides, waxes, preservatives, and soil. That’s why every foodservice professional needs to understand the importance of cleaning vegetables and fruits. We've provided two quick methods below, so you can continue to serve your customers fresh, healthy, and safe foods. Why Do You Have to Wash Fruits? Washing fruit and vegetables is an important part of food safety because it can help prevent cross-contamination while ridding your produce of pesticides or chemicals. Thoroughly examining and washing fruit before service increases your chance of avoiding a foodborne outbreak caused by contaminated produce. Plus, the chemicals used in pesticides can irritate guests with sensitive stomachs or allergies. 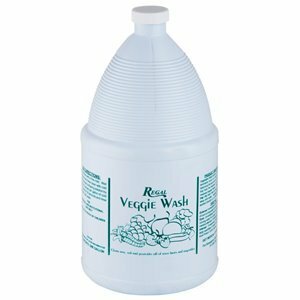 There are two common methods used for cleaning vegetables. 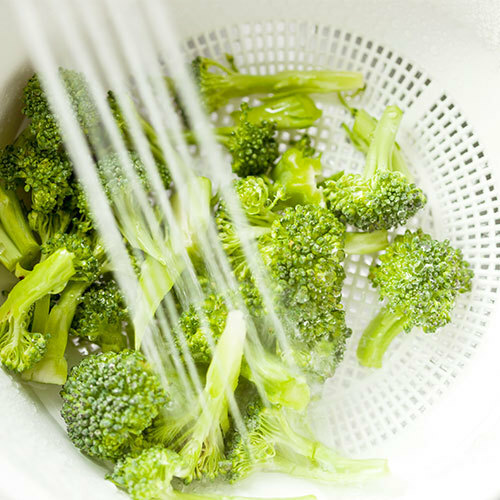 Softer produce or leafy greens should be cleaned using a soaking method, while firmer-skinned vegetables can be cleaned using a spray solution. If you are using a commercial wash, use a 1:30 ratio of wash to water, or approximately 4 to 6 oz. of wash to 1 gallon of water. If you’re opting for vinegar instead, it is recommended you use a ratio of 1 part vinegar to 3 parts water. Some cooks only use warm water to soak and rinse their produce because they either purchase certified organic fruits and vegetables, or they grow their own that contain no chemicals or harmful preservatives. However, other cooks prefer to use a cleaning solution during prep, and if you’re purchasing from a bulk supplier or non-organic source, it’s important to thoroughly clean your produce. Because they can break down easier, softer produce and leafy greens should be soaked in a cleaning solution. This method is also ideal for tightly packaged fruits such as berries or vegetables with crevices, such as cauliflower or broccoli. Not only does soaking produce rid it of harmful germs or chemicals, but it can also be used to revitalize produce for a better taste and longer life. Sanitize sink, wash hands, and use soap and water to clean all areas coming into contact with your fresh produce. Fill sink with either diluted wash or vinegar solution using the ratios above. Soak vegetables for at least 30 seconds. Place them in a colander and use hands to rub the produce while rinsing with cold water. Let produce air dry and enjoy. Produce with firmer skin such as eggplant, potatoes, or cucumbers may benefit from using a spray and scrub to thoroughly clean away dirt and pesticides. This method is also ideal for larger, smooth fruits and vegetables without crevices or cracks. Wash hands and all areas coming into contact with your fresh produce with soap and water. 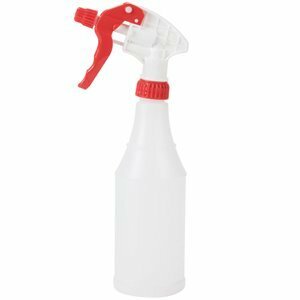 Fill a spray bottle with your solution and mist the entire surface of each vegetable or fruit. Let the coated produce sit for at least 30 seconds. Use your hands or a vegetable cleaning brush to scrub produce and rinse the solution off under cold running water. Whether you’re using lettuce, cherry tomatoes, and cucumbers to make a tossed salad, or you’re blending a smoothie from fresh strawberries and raspberries, these methods will ensure your vegetables and fruits are cleansed of any harmful chemicals, pesticides, or soil. By washing every piece of produce that will be served raw, you’ll greatly reduce the chance of your customers getting a foodborne illness, and you’ll be executing safe food preparation practices in your restaurant, deli, bar, or catering business.